The design of Al Thumama stadium was selected by the international jury of MIPIM/Architectural Review Future Project Awards as the winner in the Sport and Stadiums category. The stadium architect Ibrahim Mohammed Jaidah, attended the ceremony and received an honorary award on the behalf of Supreme Committee for Delivery and Legacy and Arab Engineering Bureau. For 17th consecutive year, the MIPIM/Architectural Review Future Project Awards honor excellence in unbuilt or under construction projects in 12 categories. The awards take place at MIPIM (Le marché international des professionnels de l’immobilier), one of the largest international property events, which attracts over 20,000 delegates to Cannes every March. However, the gala awards dinner is considered to be the biggest gathering of architects throughout MIPIM. All the entries are judged by renowned international jury and published in Architectural Review catalogue. Designed by Qatari architect Ibrahim M. Jaidah, Chief Architect of Arab Engineering Bureau (AEB), the stadium is inspired by the ‘gahfiya’ headdress. The winning project, Al Thumama Stadium, scheduled for completion in 2020, is not only a design inspired from local culture and tradition, but also one that is built on valuing and preserving its context. Within this particular ethos, the design is targeting a four-star Global Sustainability Assessment System (GSAS) certification for both design and construction. Cooling technology using solar energy was also devised in the design to decrease the carbon footprint of the structure in the long term. The stadium will seat 40,000 spectators with handicap access to all the seating arenas in 2022. Its capacity will be reduced to 20,000 in legacy mode and the excess seats donated to nations in need of sporting infrastructure. 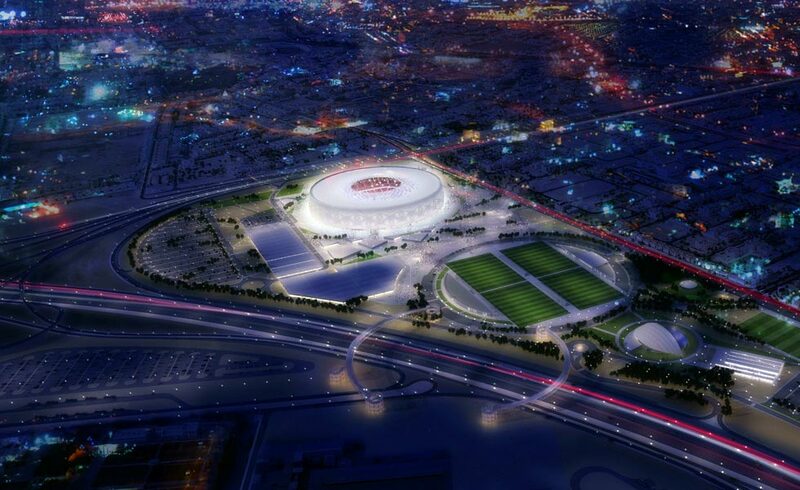 Established in 2011 by the State of Qatar, the Supreme Committee for Delivery & Legacy (SC) is responsible for the delivery of the required infrastructure and host country planning and operations for Qatar to host 2022 FIFA World Cup™. Arab Engineering Bureau (AEB), is the award-winning, first locally established architectural and engineering consultancy firm in Qatar. Its extensive portfolio includes over 1,500 projects of various typologies across the Middle East and South-east Asia.